Happy 67th … but when’s the Barmitzvah ? 72 year-old Laurence Baehr recently celebrated his barmitzvah. The son of assimilated refugees from Nazi Germany it took him a lifetime to discover who he really was – it’s never too late. Maybe the same should be said for Israel. 67 years ago the declaration of Israel’s independence was delayed at the last moment because of a disagreement over one word …. God. They settled on the word “Rock”. A few hours later the newborn Jewish State was attacked in its cradle by five Arab armies. Its survival and deliverance from that war was the beginning of a succession of open miracles that have blessed our people for the last 66 years. 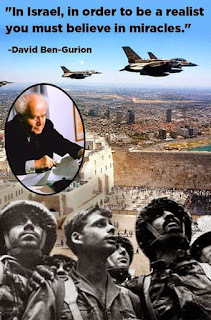 Whether it was the Six-Day-War which still defies analysis in military academies, or the Yom Kippur War’s extraordinary turnaround … or last summer’s rocket war; over 4,500 missiles fired into our tiny state in 50 days, and how many Jews were hit? How about the so-called Arab Spring? Whilst our Arab neighbors were steeped in bloody wars and Islamist barbarism, tiny Israel went about its daily life almost as in a protective bubble. Yes, some bad things have happened inside that bubble, but consider this: whilst all this Arab and Islamist mayhem was going on around us for the last 6 months, Israelis had time only for party politics and electioneering. What a blessed life! The upheaval in the Arab world also shut down our vital fuel supplies from Sinai pipelines which were being attacked almost on a monthly basis by insurgents. We could expect no help from the newly elected Muslim Brotherhood president of Egypt who was actively supporting Hamas in Gaza and turning a blind eye to their rocket smuggling. How lucky for us that Morsi was thrown out almost as suddenly as he got in? In the end, we didn’t even need the Sinai oilfields. By some amazing coincidence, oil and gas which had been sitting off our shores for billions of years happened to be discovered just in time to insure us against these Arab stoppages and, more importantly, the worldwide sanctions now being threatened against us for simply building houses in our own homeland. A wise man once said: Coincidence is God’s way of staying anonymous. “Even if our mouths were as full of song as the sea, and our tongues as full of joyous song as its multitude of waves, and our lips as full of praise as the breadth of the heavens, and our eyes as brilliant as the sun and the moon, and our hands as outspread as the eagles of the sky and our feet as swift as hinds -- we still could not thank You sufficiently, HaShem our God, and God of our forefathers, and to bless Your Name for even one of the thousand thousand, thousands of thousands and myriad myriads of favors, miracles and wonders that you performed for our ancestors and for us …” . The prayer goes on to list all the miracles and kindnesses, like the Manna in the desert which, in the present era, we’ve now found in the sea. Outside our little bubble of miracles, we watch the rest of the world paralysed in the face of radical and violent Islam, overwhelmed by hordes of new refugees and mired in national debt. So - in contrast to the US Democratic Party which in 2012 removed all reference to God from its convention platform - would it be so terrible if next Independence Day the government of Israel corrected that unfortunate and ungrateful choice of words 67 years ago? Like for Laurence Baehr, it’s never too late to rediscover yourself. Speaking of rocks, it seems ironic that Moses was denied entry into the Land of Israel because of an incident with a rock. The explanation at the time was that Moses did not sanctify Hashem in the presence of his people. Well, isn’t this the same thing? To mark the 80th anniversary of the Nuremberg Laws, 16 European Union foreign ministers have called for labeling (read: boycotting) of Jewish products made in the West Bank. I say we should label settlers’ produce with pride. Remember Gush Katif? Jewish farmers turned sand dunes into world-beating crops. They made up 15 percent of Israel’s total agricultural exports. 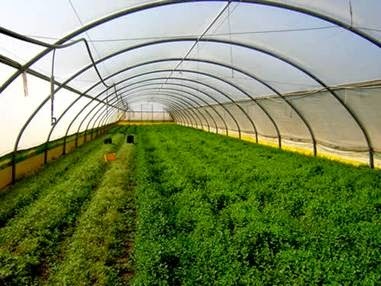 The 400 farms in its 20-odd settlements pioneered bug-free lettuce and exported 70% of Israel’s organic vegetables and 60% of Israel’s prize-winning cherry tomatoes. That was until Hamas converted the greenhouses into rocket launching pads. Now that same blessed produce is being grown in our ancient lands of Judea and Samaria. They are much too good to export to Jew-hating Europeans. They should be labelled proudly and reserved for their most worthy and deserving consumers … Israelis. Let Israel export the produce of the Galil and Negev to the Europeans, and let our people eat Mituv Haaretz. In the words of Isaiah: if you follow in my commandments you shall eat from the best of the land.